This article submitted by Erin Aagesen on 8/16/00. Ten campers and five counselors spent part of last week on Second Island for an Outdoor Leadership program through Camp Courage. Camp Courage uses the island to expand upon its programs. 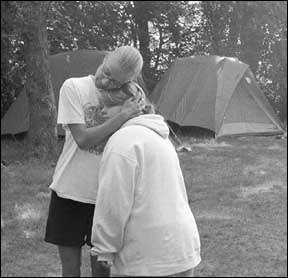 At right, a camper gets a hug from one of the counselors. The main project of the group was building a beach. They moved a pile of sand from the mainland to the island and also cleared weeds in the beach area. They also did all the work at the camp site, including setting up tents, digging a fire pit, preparing food, and cleaning up after meals. One morning, they even surprised the counselors by making them breakfast before they woke up. For fun, they went swimming and tubing, took a pontoon ride around the lake, and visited the observation tower at the Regional Park. On Thursday, they watched the Paynesville Area Center Harmonica Band perform at the Area Center and had lunch with the seniors. Second Island was donated to the camp in 1965 by Con and Mary Winther. They had owned 11 acres of the island for many years before buying the remaining six acres so the whole island could be donated to Camp Courage. "We didn't have any children of our own," explained Mary, of the decision to donate the land. "We wanted to help the less fortunate." Now, Camp Courage takes groups for day trips or overnight stays on the island. Camp Courage is a residential camp that serves disabled children and adults year-round. It is located between Annandale and Maple Lake. The Outdoor Leadership group is unique in that they camp for three days and two nights away from the main camp and do work projects. Each summer, there are only one or two sessions of this kind. Participants are chosen for this session based on prior experience as campers at Camp Courage. These kids had been good campers and showed promise of being leaders and hard workers, so they were asked to come back. They are generally teenagers who don't qualify to participate in the usual camp because of their age, or because they don't require special services, such as speech therapy, any longer.